Greenpeace activists detained Tuesday for seizing a Gazprom oil rig platform in the Dutch port of Ijmuiden have been released. The group was trying to prevent the Saturn rig from being deployed in the Arctic, claiming it would damage the environment. The six activists were charged with disobedience to police and will have to pay a small fine, Greenpeace Russia reported on its website. The activists had chained up the support beams of the rig and unfurled a banner reading “Save the Artic!” The act of protest involved 30 activists from the Netherlands, Belgium and Germany. 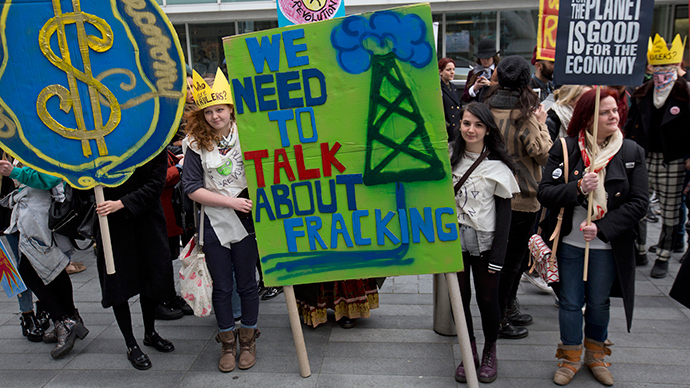 “The Dutch police managed to free the platform from activists five hours since the start of the protest. Six climbers who chained up the supports of the rig have been detained, but they have not yet been charged,” said Greenpeace in a statement to AP. Head of Greenpeace Russia’s energy program Vladimir Chuprov told Russian agency RIA Novosti that the GPS Saturn platform had never drilled in Arctic seas before and was ill-equipped to deal with extreme conditions. Gazprom released a statement following the incident saying the platform had begun its journey to the Dolginskoe oil field in the Pechora Sea. The company insists that the rig will not be extracting oil: it will only be drilling boreholes. In addition, Gazprom said that Saturn was specially upgraded in 2009 to work in Arctic conditions. Elsewhere, in the Norwegian Arctic, Greenpeace activists seized an oil rig in protest of Norwegian Statoil’s exploitation of resources in the area. 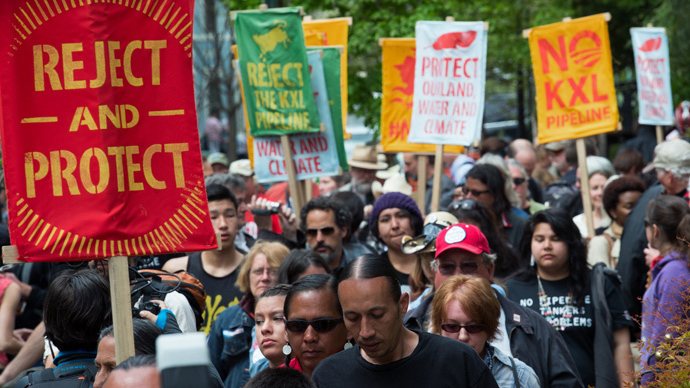 The environmental rights group has branded the state-run, Norwegian company as an “Arctic aggressor” because of its plans to expand drilling. Activists scaled the rig in the early hours of the morning and put up banners saying “No Arctic Oil” and “Stop Statoil’s Arctic race." 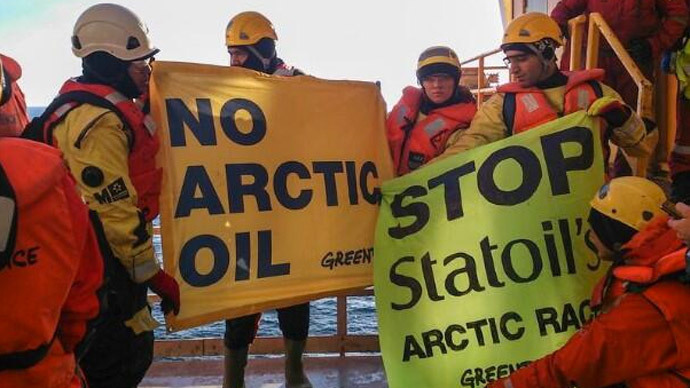 The group objects to Statoil drilling in the Hoop area of the Barents Sea. They have voiced concerns it will affect Bear Island – a wildlife sanctuary that is home to many rare species. "Hoop is an area with known geology, low pressure and temperature, and where Statoil has robust plans for the operations,” said the company in a statement. "An oil spill is very unlikely, at the same time we have put in place a number of barriers to be able to handle a situation should it occur," the company said. 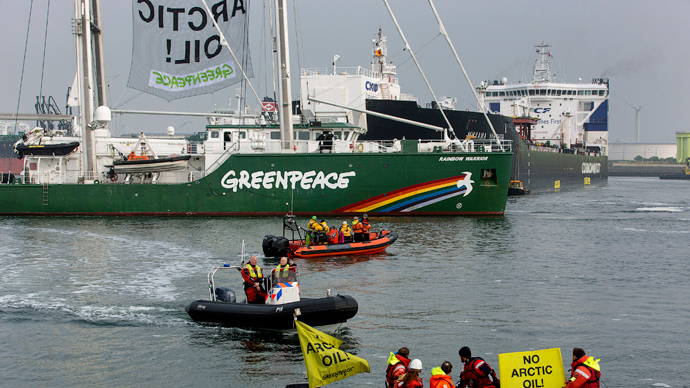 Last September, the Russian authorities detained 30 Greenpeace activists and their boat, Arctic Sunrise, for an attempt to disrupt the operations of Gazprom’s Prirazlomanaya oil rig in the Arctic Sea. The protesters – who were nationals of 18 different countries – were initially taken into custody on charges of piracy, which carries a sentence of up to 15 years in jail. However, they were granted bail through a Kremlin-backed amnesty after around two months in custody.